Our aim is to provide a professional cost efficient service to you the customer no matter how great or small the task. To deliver an on time exact service so supply is not interrupted weather its one load or five hundred each delivery on time and intact. 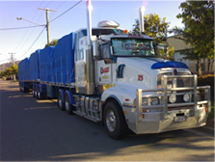 To give you the customer the satisfaction of one phone call to Aboods and your transport task is taken care of. Of all your transport requirements.